This part of the kit was very bold and sophistocated. None of these designs were demonstrated, but they were displayed on the show, which can be seen by clicking here. The beaded section of this necklace is made by threading a selection of beads onto 2 lengths of beading wire and crimping loops at the ends so that the braid can be started from these loops. Each section of braid requires 2 x 1m black satin cord and 2 x 1m gold satin cord. Centre the 4 cords on the loop and proceed to braid using the instructions for Half Round Braid. Put black in slots 32, 1, 9 and 24 and gold in the other slots on either side of the dots. 1. The braid is made using 4 x 1m black satin cord and 4 x 1m gold satin cord. Make sure that the pendant is threaded onto the braid before the second end of the braid has been finished off with end caps. The braid is Round Braid. 2. Cut 3 lengths of 30cm of beading wire. Crimp all three together into a loop at one end. Add a crimp cover. Thread one druzy onto all three strands. Thread 3 pearls onto 2 of the strands and 1 onto the other. 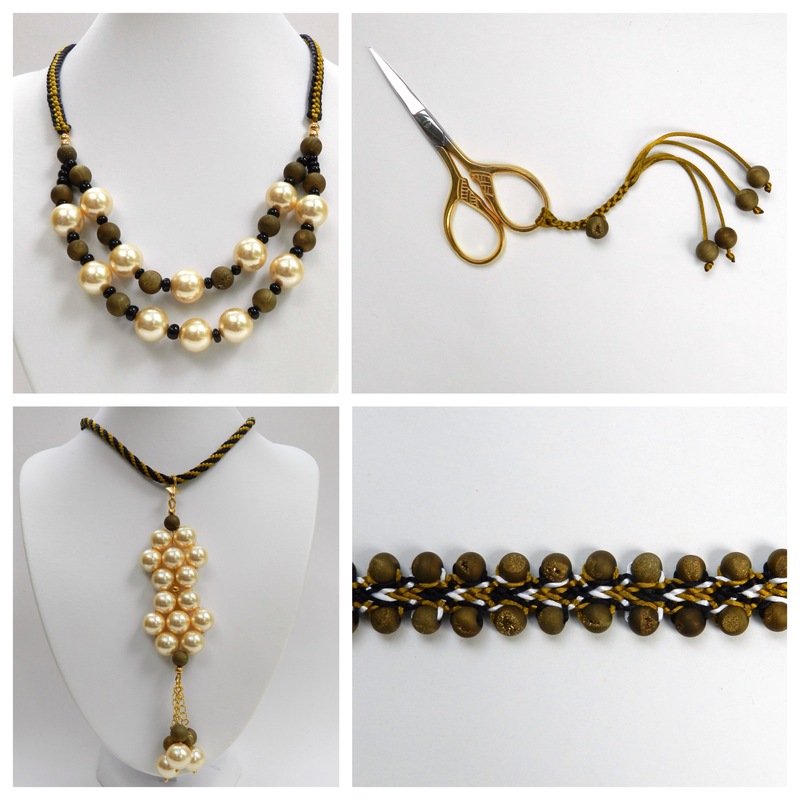 Manipulate the pearls into a flower shape and crimp all 3 strands together. Add a crimp cover. Repeat the flower druzy, and crimp and cover again, forming a loop at the bottom. 3. Attach chain and beads on headpins to finish off. This design can be used to great effect with any 6mm round beads. This bracelet is made on the square kumihimo plate using the instructions for 10 cord flat braid. Braid for 1-2cm. Add a bead the next time the cords at 3 and 8 are moved. Carry out two complete sets of moves and then add beads again on either side. Continue with this pattern until the desired length is reached. Do not forget to take account of the length of the clasp. These work well with any braid structure and are a great way of using up odd beads. Use 15-20cm lengths of satin cord attached to the handle of the scissors with a lark’s head knot. Braid for the required length and seal the braid with a drop of clear glue. Individual beads can be braided into the braid here and there. Attach stones or dangles to the cord ends with knots. Trim and seal the knots with a naked flame or glue.